Large molecules are dominating pharma sales and FDA approvals. At the end of 2015, seven of the top 10 best-selling prescription drugs were large molecules. According to a 2014 article in Nature, the overall approval rate for small and large molecule therapeutics is nearly 10% (comprised of lead and secondary indications). The study also shows that large molecule drugs are twice as successful in gaining approval compared to small molecule drugs, making them more attractive to drug companies. With higher success in approvals and clinical trials, more companies are entering the large molecule space. As a result, there is a flood of novel complex molecules appearing in analytical labs. Many labs, who are often more familiar with small molecules, are finding it difficult to quantify increasingly complex samples. Waters is also thinking large and is generating new solutions for the most difficult challenges facing analytical scientists. 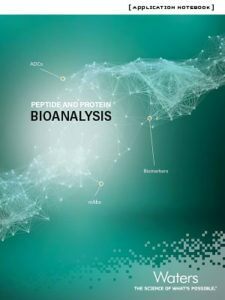 Take a look at our Peptide and Protein Bioanalysis Application Notebook (newly updated for 2017) and explore the solutions for over 47 unique molecules, including peptides, proteins, mAbs, ADCs, biomarkers and more. If you want to explore our applications online, check out our DMPK and Bioanalysis Knowledge Center. Are you Thinking Large, too?